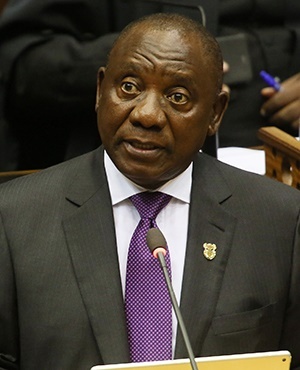 WITNESSING the ANC’s political and economic mixed messages of the last few weeks, it has become increasingly clear that Cyril Ramaphosa’s two months as ANC president have been substantially better than his first two weeks as South African president. Elected on a wave of optimism, Ramaphosa was an almost ‘maximum pendulum swing’ away from the leadership of Jacob Zuma. Everything about the man smacked of new modalities, from ethics to policy execution. In the mid-December to mid-February period, just not being Jacob Zuma was enough to set the bar high – albeit off a dismally low base. And the Davos-friendly Ramaphosa was perfectly placed to impress. But how things have changed since February 15. South Africa has gone from an unrealistic ‘Ramaphoria” feel to an equally sensationalist yet depressingly bleak ‘Ramaruin’ sentiment. South Africans have been used to schizophrenic politics for some time. And, given the ANC’s increasingly polarised internal dynamics, these contradictions have only served to increase in recent years. But now, they threaten to undermine any progress South Africans were starting to sweetly smell. First it was Malusi Gigaba’s budget that found favour among the broader business community, but unleashed a flurry of condemnation from the trade union movement and other civil society movements. So much so that the ANC was forced to backpedal to a degree, calling for a review of zero-rated foodstuffs to assist the poor in combating the double whammy of VAT and fuel levy increases. Surely, such concessions should have been part of the original budget itself. In this way, Ramaphosa’s ANC clearly got off on the wrong foot with poorer segments of the populace and now needs to save face through additional concessions. Secondly, the Cabinet reshuffle, while pretty significant, was a pastiche of compromises. Once again, the business community would cheer a retreaded but highly respectable Nhlanhla Nene and Pravin Gordhan back in the economy’s driver seat, but many former Zuma supporters (JZ & NDZ) were retained. While internal ANC dynamics and the very ‘soft’ Ramaphosa victory were obvious contributory factors, the trade-offs are still an inhibiting factor to a full fumigation of the era of rot. Not to mention the optics of former president Zuma seated and beaming at the ANC’s 2019 elections workshop as though nothing has changed. Again, the mixed signals diluted the ‘renewal’ approach that provided Ramaphosa with such a kickstart only 14 days ago. But both the budget and the Cabinet reshuffle were compromises that were still largely acceptable within President Ramaphosa’s new style of inclusive government. The ‘Ramaphosa effect’ could withstand some degree of dissatisfaction on both accounts and come out still with its message of promise and hope intact. That was the case until Tuesday last week when – on the back of an EFF motion in favour of land expropriation without compensation – the ANC was forced into a political corner and, with amendments, voted with the EFF. It might have been a piece of sublime tactical politics from Julius Malema, but it was also a very weak hand played by the ANC. Suddenly, the party became a follower rather than a leader. Within an afternoon – despite the change of semantics in the resolution – it was Malema who was calling the shots. Within a day, the EFF leader was even fielding questions from an ever-sycophantic media – as if he held the key to the passing of any constitutional amendment. And technically he does, as his numbers are needed by the ANC to enable this. Malema might have been looking a little shellshocked once Jacob Zuma was ousted – after all, the ‘gift that kept on giving’ was no longer there. But suddenly, his role as kingmaker was back in play. And there’s the rub. While legal brains will no doubt ponder upon a host of wording options for any constitutional amendment in an effort at urgent damage control as confidence in the economy and adherence of the Constitution take a dangerous pounding, there has been a disturbing lack of leadership from the ANC on the broader debate. It’s all been left to Malema – no doubt just the way he likes it. For an issue as potentially damaging and divisive as this, the softly-softly reassurance from Ramaphosa has been weak. With an 8% party (the EFF) dictating the narrative, Ramaphosa needs to substantially up his own rhetoric. Similarly, the almost embarrassingly weak comfort from newly reappointed Finance Minister Nhanhla Nene just got lost as Malema pounded his message home. And, as if that was not enough, Malema’s linkage of the land issue to his desire to unseat Nelson Mandela mayor Athol Trollip was filled with racial invective, elevated even by his (Malema’s) own standards. Such language is not only a direct contradiction to the spirit of the new Ramaphosa era, but the ‘cooperation’ between the ANC and EFF on the expropriation matter lends added credibility to the Malema world view – especially in the absence of any leadership by Ramaphosa on this matter. But perhaps Ramaphosa just cannot provide the necessary reassurance. Remember that at Nasrec in December, the ANC’s land debate was so fiery that competing factions were physically at each other’s throat. With the EFF pressing the ANC’s most sensitive buttons on this issue – and Ramaphosa just too timid to frame the debate in the face of increasing EFF provocation - South Africa’s brief honeymoon with the new president is more vulnerable. One can surely not disagree with President Ramaphosa that the issue of land needs to be clarified once and for all – after all, it can gnaw away at the tenuous goodwill achieved. But it is equally the responsibility of the majority party to frame a debate within the context of a deeply divided nation becoming dangerously more divided day by day on this very issue. President Ramaphosa should know that pleasant platitudes might just not be enough when it comes to fending off the Malema factor, who clearly smells blood by dominating this narrative. Ramaphosa therefore faces an early and exceptionally serious challenge. In framing the debate, he has to distance himself from the increasingly vocal racial undertones and from those who view a simple (and populist) constitutional amendment as an invitation to undo the post-1990 reconciliation compromise with a series of potential unintended and deeply damaging consequences. After only a few weeks in office, playing ‘nice’ might not be enough any more. But whether his own party will let him lead, is entirely another question.